This month I have chosen one of my all-time favourite objects, and one that I feel is a bit of an enigma. IC1396 is a huge emission nebula in Cepheus that doesn’t have a “popular” name. It contains the beautiful Garnet star – mu Cephei, and the well-known “Elephant Trunk” nebula VdB 142, as well as a number of other fascinating regions of dark nebulosity. Yet – not only does this nebula not have a popular name, it isn’t imaged that much either. There are two major reasons why this region isn’t imaged too frequently. 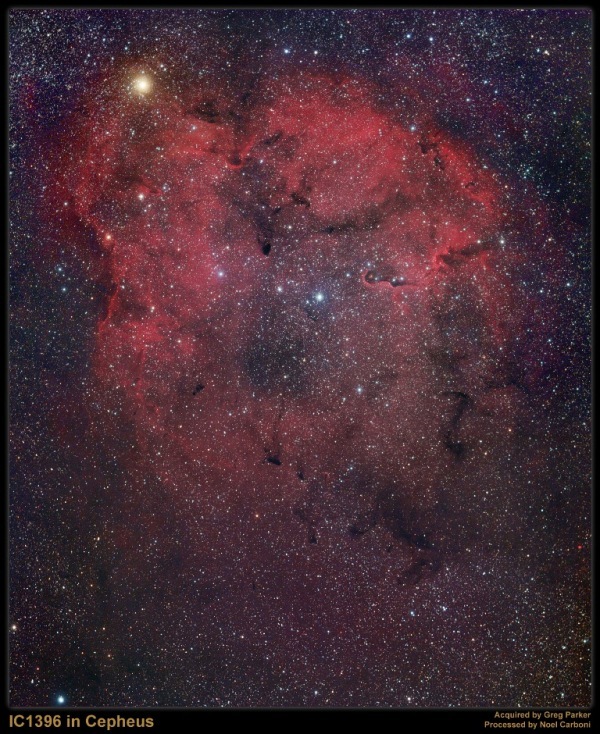 As mentioned above it is HUGE – it even required a 2-frame mosaic with the Sky 90/M25C combination which has a field of view of 3.33 x 2.22 degrees! 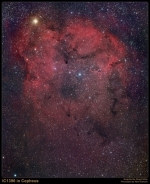 The other problem with IC1396 is that it has low surface brightness, i.e. it is pretty faint, and requires long sub-exposure times. IC1396 also benefits greatly from additional narrowband data so you should include some H-alpha and OIII if at all possible. This is a simply wonderful object deserving of as much time as you can invest in it. You can start imaging this one in August quite successfully even though the image below was acquired at the beginning of October. Remember, you will require lots of long RGB subs and additional narrowband data with even longer subs to bring out the fine detail present in this one. Unless your focal length is very short (i.e. a camera lens), then you will also need to create a mosaic – but this one is definitely worth all the effort you put into it!